Please help me understand the bow filler cushion. My RLXi doesn't have one. I've never had a boat that had one. I assume it makes lounging more comfortable? Since you can't sit, does it make riding in the bow less comfortable? Is it worth trying to find someone to make me one? Do they cave in if a heavyweight steps on the center of it? 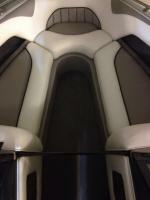 It makes the bow area like a lounging area, rather than sitting. Plus you can store things under it. I'm curious about this as well. What's the easiest way to construct one? I've seen essentially what amounts to a cushion on a box, but I'd rather have the ability for storage underneath. This. It's on our boat 100% of the time. Depends on the boat. I also have an RLXi and it's pretty much a slalom tractor only. 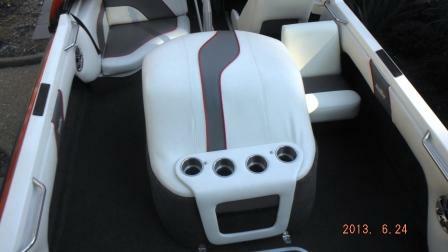 The filler cushion and rear bench are stored. IMHHEO nobody should be allowed up front unless you're docking. I wish I had a jump seat. The one thing I like on PS197's over the RLXi is the center seating. I'd like a bow filler too. I might fab one up next year. 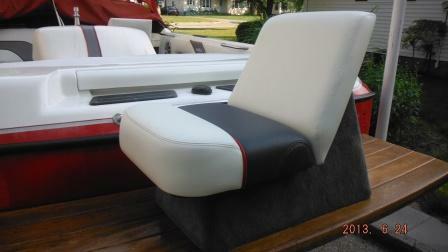 Sits on the edge of the fiberglass, which sticks past the bow seat cushions. Ah - so if you use a center cushion then the side cushions must be smaller than the ones in my FIL's RLXi - because there is no ledge sticking out beyond his cushions. 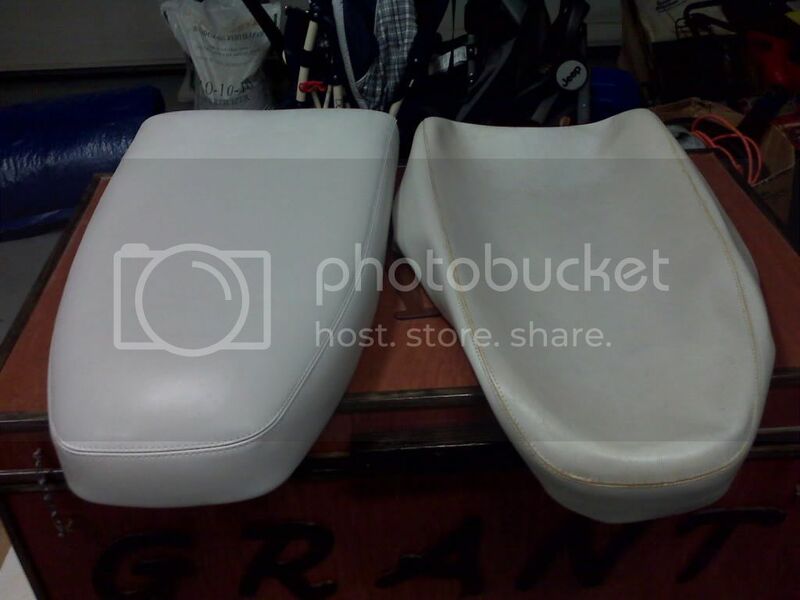 Not something you could just add later without replacing all of the bow cushions? We have one in our Txi all the time. The kids love it. the driver seat for cruising. 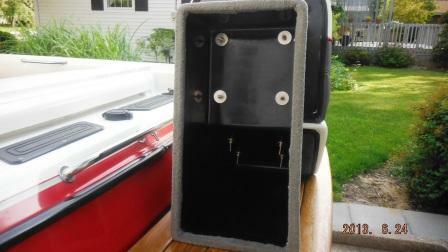 Dock lines, fenders, and anchors are stored under the bow seats. Standing provides much easier access to them versus crawling on my knees. Interesting how we all do things so differently. I keep the dock lines, fenders & anchor in the rear corner seat, passenger side. Bow area has the disco ball, a couple blocks of lead (40 lbs each), spare rope & handle, a couple orange keyhole vests, 2nd anchor, and other miscellaneous stuff. None of which I mess with very often. So the bow cushion is in there 100% of the time. When I had a 205, the rear seat was stored in the garage a lot. Well of course it does! 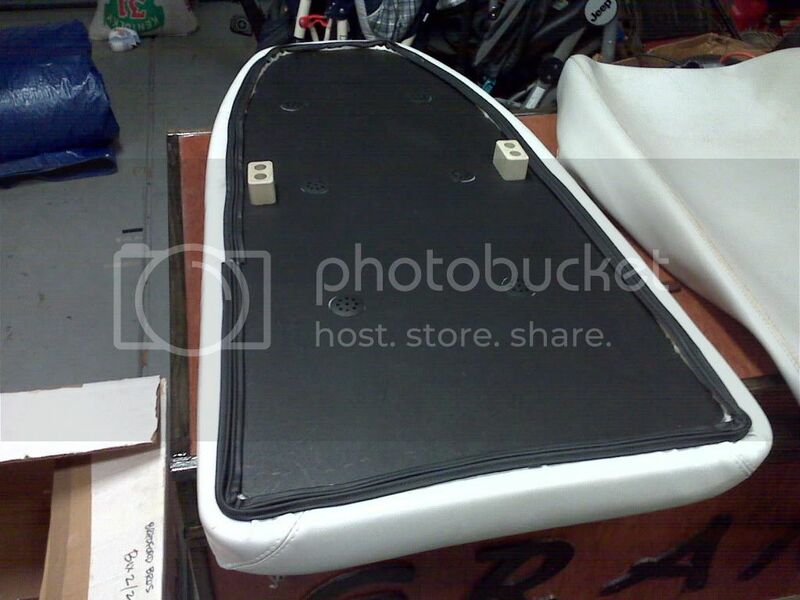 ...but I'm like 95% certain that my bow seats overhang the fiberglass, so I'd have to build a box. I'll check today. There isn't any piping on the center section IFAIK so most are probably white only. and it couldnt be hard to make one assuming you have the edge for it to sit on. 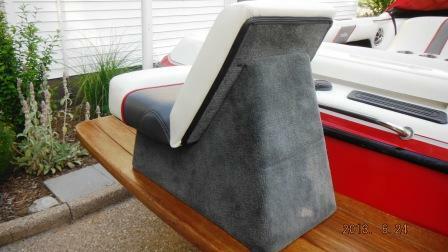 I'll see how we use the boat this summer, and decide then if we would use a bow cushion. 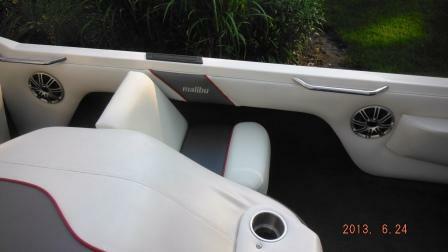 Didn't need one on my last boat, closed bow Nautique. But I think the cramped closed bow 19' boat was part of the reason we quit going out much over the last few years. But I think I need one of those jump seats. Maybe then we could leave the back bench at home. Damn. My bow seats overhang quite a bit. And at it's narrowest, the distance between cushions is only like 5 or 6 inches. Would be a weird looking box/cushion setup. we stick our flip flops under there. I'm still a little surprised that the A24 doesn't come with one. I can actually roll up & get my boat cover under mine.